The Nigeria Extractive Industries Transparency Initiative (NEITI) released its 2013 audit reports on Monday, analysing the returns in solid minerals, oil and gas exploration in the country, thecable.ng reports. The reports, which were categorised into oil and gas, and solid minerals, had a number of interesting revelations for the Nigerian state and the state of her mining industry. Gold is one of the most expensive commodities on the international market. As at Tuesday afternoon, gold was trading at $1241.70 per ounce (28 grams). Sand on the other hand sells around $70 for a truckload. But the NEITI results shows Nigeria is largely underutilising its gold reserves, and focusing on other minerals like limestone and sand. 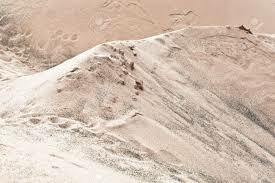 According to its 2013 solid mineral audit report, 5.8 percent of solid minerals production came from sand, while about 0.0 percent to 0.4 percent came from gold. Going by the value of royalties paid, Nigeria makes more money from sand, than it does from gold. NEITI says Nigeria has about 52 solid mineral resource across all states of the federation, with every state possessing at least two mineral resources. But of all 52, limestone was exploited more in 2013, than 51 others put together. Limestone, which is used for making cement, was responsible for 52 percent of solid mineral productions. Granite, Laterite, and sand were responsible for 27.8, 11.3 and 5.8 percent respectively. Forty-eight other minerals were responsible for only 3 percent of the country’s solid mineral productions. Dangote Group, owned by Aliko Dangote, generates more mineral resource revenue for the government, more than the rest of the nation put together. In 2013, the group was responsible for 53 percent of the government revenue, that is, N15.9 billion of the total N33.86 billion accrued that year. WAPCO, Ashaka and UNICEM, which are cement making companies, were responsible for N5.6 billion N2.9 billion and N2.06 billion respectively. Of the 619 registered companies in the sector, only five companies accounted for 93 percent of Nigeria’s earnings in solid minerals. 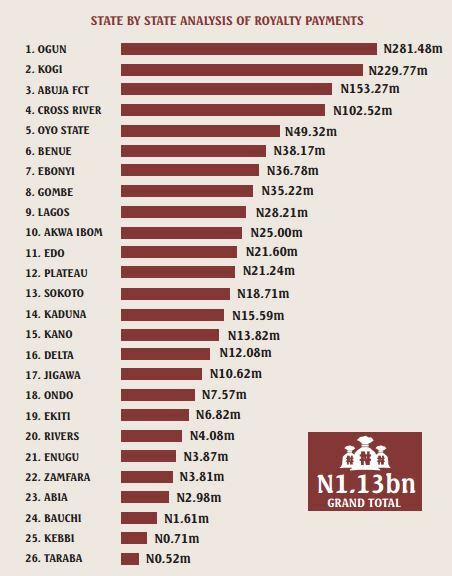 Ogun and Kogi states led the pack for housing companies that make the highest amount of royalty payment to the federal government, while Kebbi and Taraba states came in at the bottom of the table as shown below. Ten states made no such royalty payment in the year under review. NEITI’s oil and gas report audit report shows that $12.9 billion was not remitted to the federation account, by NNPC from 2005 to 2013. Beyond this, the report corroborates the National Reserves Governance Institute (NRGI) audit report, released earlier in the year, emphasising that the Nigerian Petroleum Development Company (NPDC) may be the opaque part of the NNPC. NPDC has been reflected in most audit reports as a part of the NNPC, which controls some OMLs without necessarily remitting funds to the federation account. The PwC report on the oil and gas industry, also indicted the NPDC.